Lost in translation: It isn’t only an acclaimed movie that I could not bring myself to like. The language barrier is one of the biggest problems we have when writing articles, and even more so when developing and writing recipes. Not only do you have two people here who speak different variants of English, and for whom ingredients and methods can have different names, but we also have a global audience that, sometimes within the same country, does not use the same words for the same things. This is why we are revisiting the recipe for this traditional Dominican cornbread. One of our solutions has been simply to try and use American English as much as possible (after all most of our audience hails from the USA). Another is to try hard to describe rather than name things. This has solved some of the problems, but not all. Take cornmeal, for example. It’s called harina de maiz in Spanish, a not quite literal translation. On top of that if you study the supermarket aisle you will find several products labelled “cornmeal”, and they don’t all look the same. The cornmeal that is equivalent to the Dominican “harina de maiz” and that we use throughout our sites is not the coarse one that is used in some Southern US cuisines, neither is it the fine one used in Venezuelan cachapas, for example. Both would produce results far from the intended ones. So how do we solve this dilemma? Let’s try this: If you are unsure, and you have never seen the ingredient used in our cuisine, please feel free to ask. Not only will I try to find the answer (I’m not familiar with every brand, obviously), but there might be somebody from your neck of the woods who does know the correct brand or name. Deal? And by the way, our cornmeal has roughly the texture of cane sugar (finer than polenta). Pan de Maiz (Dominican Cornbread) is served with non-dairy cocoa or coffee as a snack, or as dessert after a meal. It is easy to prepare and very popular in the Dominican Republic. Keep in mind that this is not as sweet as a regular cake, and its texture is drier/rougher than cakes made with wheat flour. This is why is best served alongside your favorite drink. Give it a try. Pan de Maiz Recipe (Dominican Cornbread): serve with cocoa as a snack or as dessert. It is very popular in the Dominican Republic, and for a good reason. 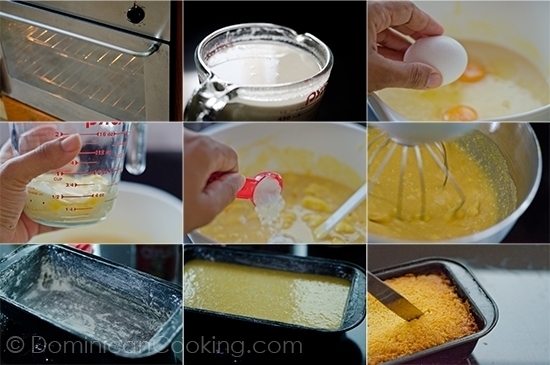 Mix milk and cornmeal. Let it rest for an hour (this is an optional step, but I have found it results in a more tender cornmeal bread). Pour the cornmeal mixture into a large bowl. Stir in eggs. Add butter (leave just a bit for covering the pans). Add cornstarch, salt, raisins (if you are using them), baking powder, cinnamon and sugar. Mix all the ingredients by hand or mixer until all the ingredients have been incorporated. Butter and flour two small (9" [23 cm]) loaf pans or regular 9" [23 cm diameter round pan and 3" [7.5 cm] tall. Pour the batter into the baking pans making sure to stir while doing so, otherwise the solids will fall to the bottom of the mixing bowl (do not worry if it is too runny, that is OK). Bake for 35 minutes or until you insert a knife and it comes out clean. Cool before removing from the pan. Serve with hot cocoa, coffee or hot drink of your preference. Do not expect something that has the texture of a cake. Dominican pan de maíz is drier, more dense and less sweet than your regular cake. For a result closer to a cake substitute 1 cup all-purpose flour for 1 cup of cornmeal (skip the resting time). It did not work out for me. I followed the instructions step by step. The result was a compact, dense “bread”. I ended up slicing it and making biscotti. What did go wrong? Can I have the background to this cake? Like can I have the facts to when and where the pan dulce de maiz is eaten and any holidays or traditions that are associated with this cake. If yes, please reply ASAP. Thank you so much for your help. No special occasion or time. Just when the mood strikes. It would be a very different dish, and I am not sure how it would work. Excited about your site & all the yummy recipes! My family is gluten free & this looks delicious 🙂 We planning to move to the DR at the end of this year as we are going to be missionaries there. So glad I came across your site! Have a great time in our small piece of island. And enjoy every bite of your stay here. I just mixed milk and cornmeal, and it’s more of a dough than a batter. very dry and hard to mix. Is this right? I thought it would be a batter. I am using harina de maiz.